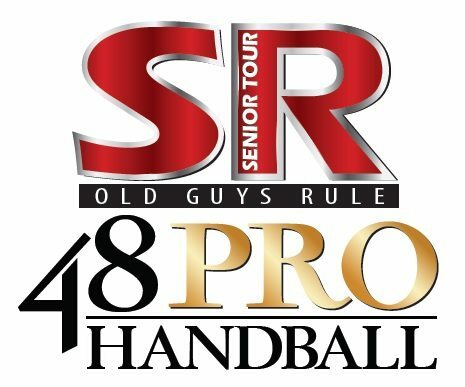 The World Players of Handball’s Race 4 Eight IV, Women’s Race 4 Eight II and Senior Race 4 Eight III seasons conclude with the Race’s most prestigious event, the WPH Aces Player’s Championship in Salt Lake City. The season kicked off in Southern California at the Simple Green U.S. Open of Handball, moved to the desert in Tucson for Stop #2, headed to Houston for the third stop, traveled back to California for the fourth stop at San Francisco’s Olympic Club and concluded its regular season on the shores of the Atlantic Ocean at the New York Athletic Club. The Race 4 Eight and Women’s Race 4 Eight were dominated by Ireland’s Paul Brady and Catriona Casey, respectively, while the Senior Race 4 Eight tour featured three different winners in three stops. 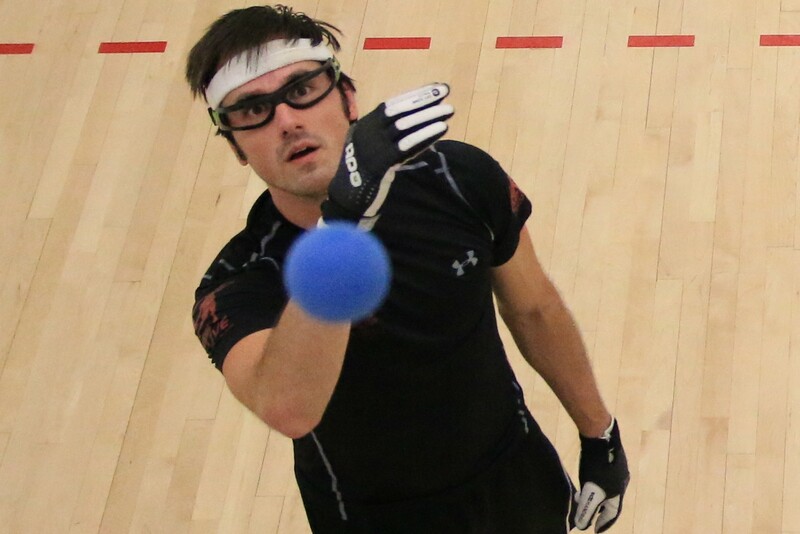 With bonus money on the line for all three tours and the most prestigious crystal on the Race 4 Eight to be awarded, players will be aiming to play their best handball in the season’s final event. Thank you to EDTL Handball and Ace Disposal for their incredible support of the World Players of Handball and the Race 4 Eight. The qualifiers have electrified fans this season, featuring the arrival of several new R48 stars, and serving as a comeback platform for former R48 elite. Daniel Cordova and Stephen Cooney spent their entire R48 IV regular seasons in the Qualifier, earning career best 5th and 6th place finishes, respectively. 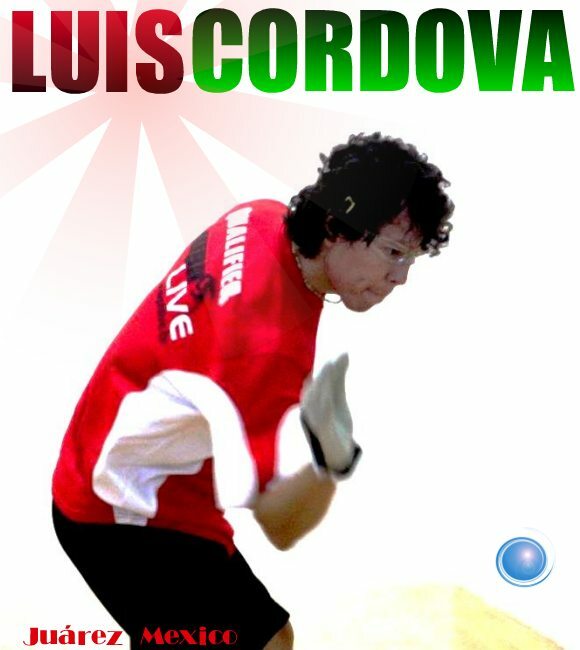 Daniel Cordova earned his first invite to a R48 event in Salt Lake City’s WPH Ace’s Player’s Championship, while Cooney finished the regular season as the 9th ranked pro. 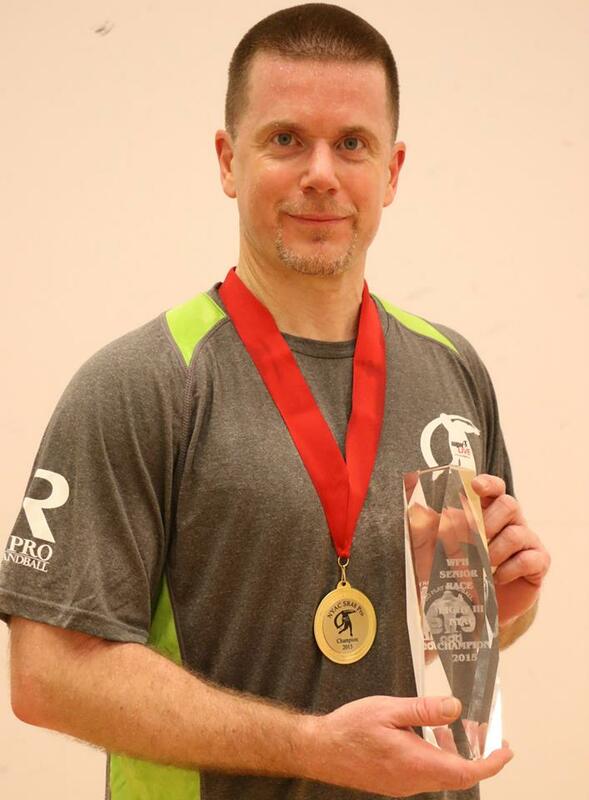 Former two-time Elite 8 star Andy Nett returned to the R48 in New York City after a 12-month hiatus to become the first qualifier to advance to a R48 IV final. Catriona Casey has dominated the WR48 in a similar fashion to her male counterpart, Paul Brady. Through six Women’s Race 4 Eight tournaments since the start of the tour in 2013, Casey has won all six events, and in 19 matches, has lost just one game. Casey will have to contend with her greatest rival, Aisling Reilly, in Salt Lake City, as well as a host of the top women’s players in the sport. 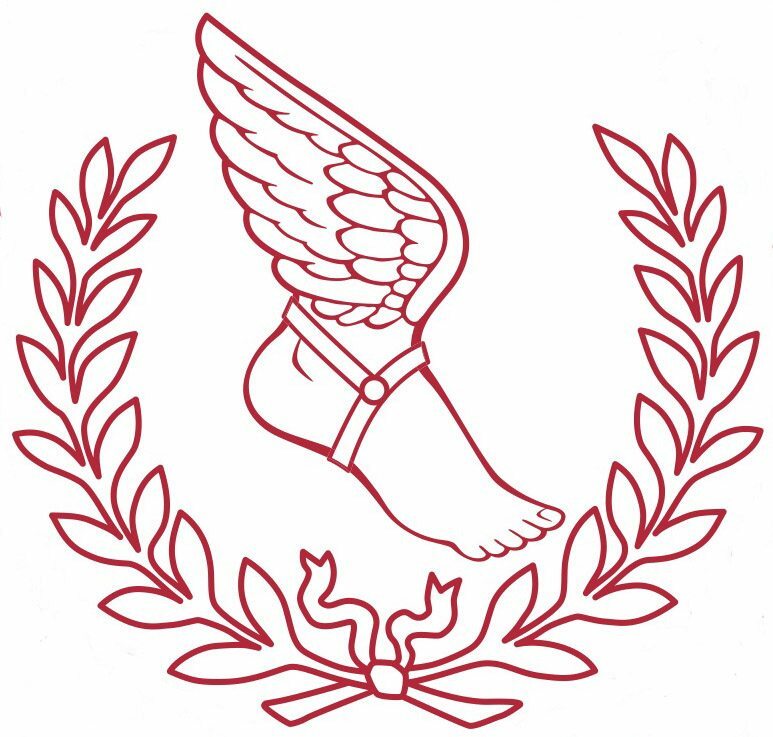 The 2015 WR48 NYAC marked the first event in WR48 history (6) in which no American women advanced to the semifinals. In three WR48 events this season, just three of the 12 semifinalists have been American (Davis x 2, Daskalakis). McMahon enters Salt Lake City on the heels of her career best 3rd place WR48 finish in New York. 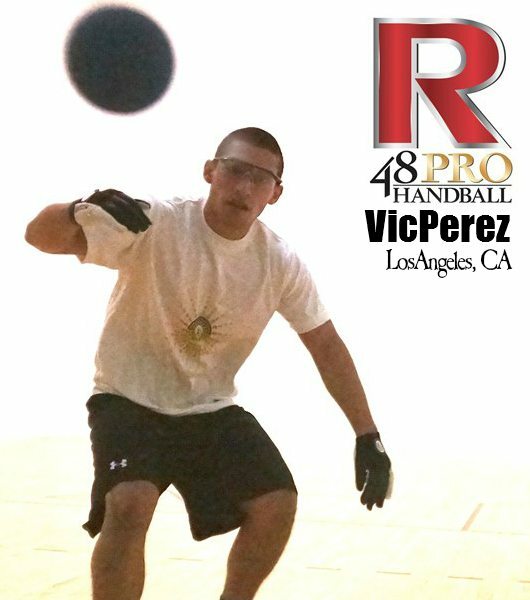 McMahon possesses one of the smoothest and most graceful games in pro handball, generating effortless power and remarkable ambidexterity. 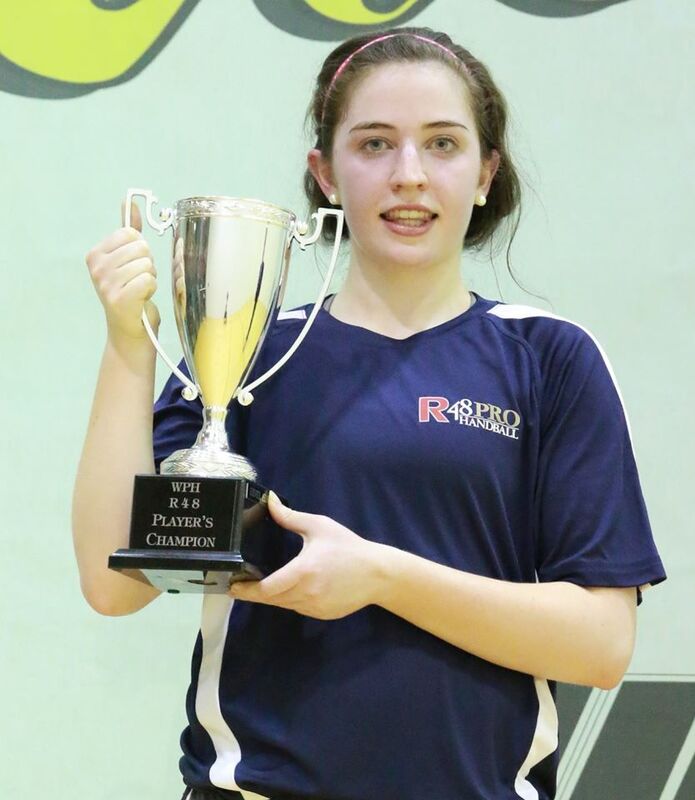 McMahon has the ability to end rallies from anywhere on the court, particularly with her spectacular left hand. McMahon could be a bracket buster in Salt Lake City! 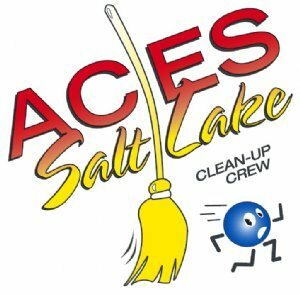 Powered by ESPN, Presented by EDTL Handball and Sponsored and Hosted by the Ace Cleanup Crew! The WPH Aces Player’s Championship will be broadcasted live on the Watch ESPN App, just as all of the Race 4 Eight events have been this season. 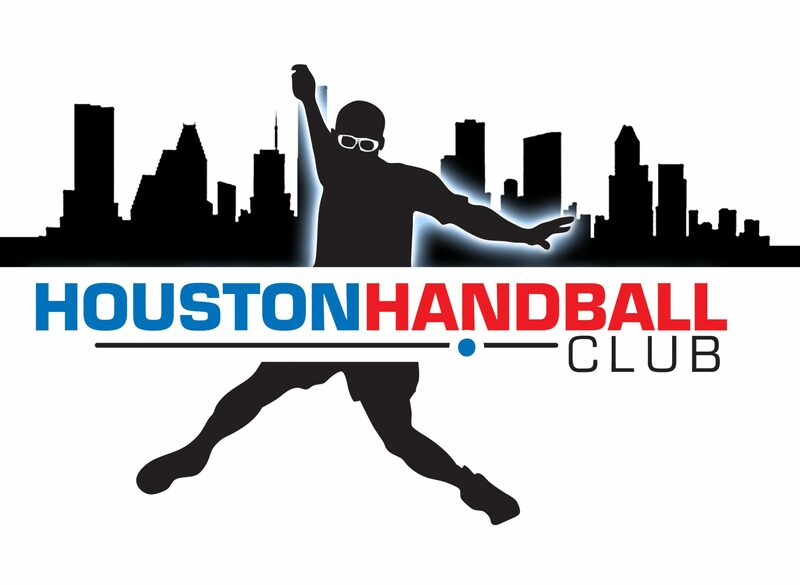 The WPH would like to thank EDTL Handball for presenting the Race 4 Eight Tour, Ace Disposal for hosting and sponsoring the WPH Aces Player’s Championship, Simple Green, the Houston Handball Club, the Olympic Club and the New York Athletic Club, all of whom have sponsored events on this season’s Race 4 Eight tour. The WPH would also like to thank all of the generous donors that have made broadcasting on ESPN possible throughout this season. 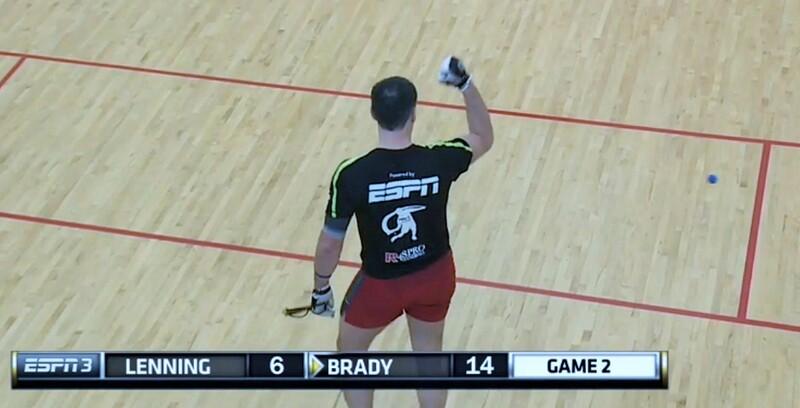 “Broadcasting on ESPN is the single biggest breakthrough in the history of handball,” boasted WPH Executive Director David Vincent. 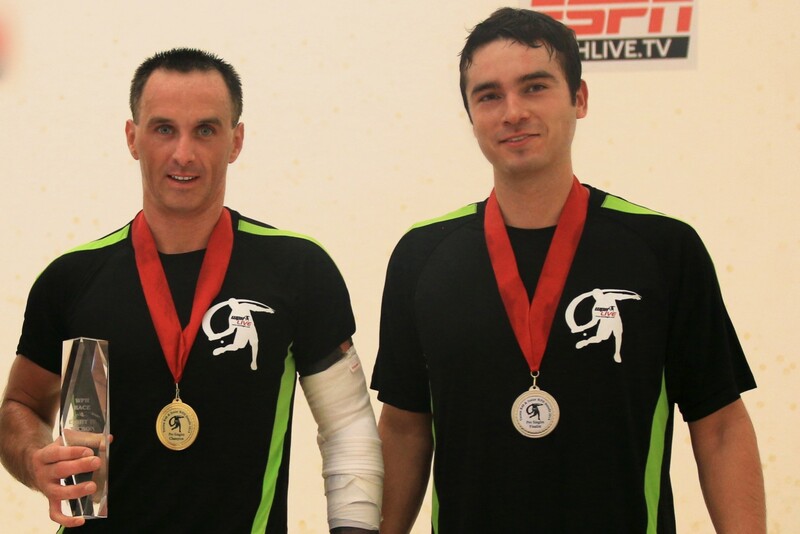 “We have so many people and groups to thank and because of all of the generosity of these individuals, handball clubs and businesses, we are able to reach hundreds of thousands of new handball viewers during each of our ESPN broadcasts. 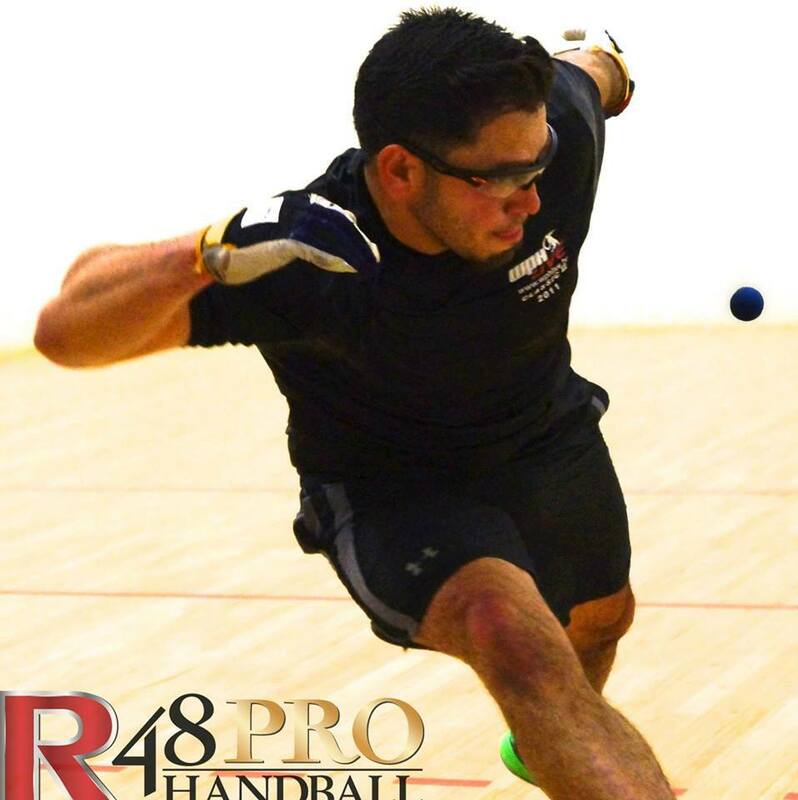 Junior WPH has been providing opportunities for Tucson Youth to play handball, travel to tournaments, and become a part of the incredible handball fraternity since 2009. 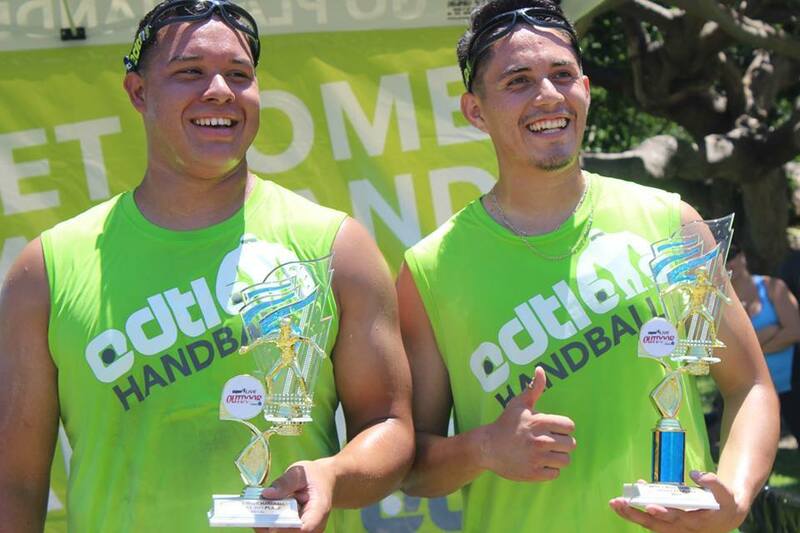 Junior WPH has been instrumental in improving the grades of its youth players, tackling youth obesity, motivating youth to graduate from high school and college, and become leaders in handball and the community. Donate on-line at www.thehandballstore.com, send your generous gifts through PayPal (extremehandball@cs.com) or by mailing checks to: WPH, 3561 E. Sunrise Dr. Suite 125, Tucson, AZ, 85718. Please consider making a tax-deductible donation today and supporting the growth of the game. 100% of the donations received by the WPH go towards junior handball development. 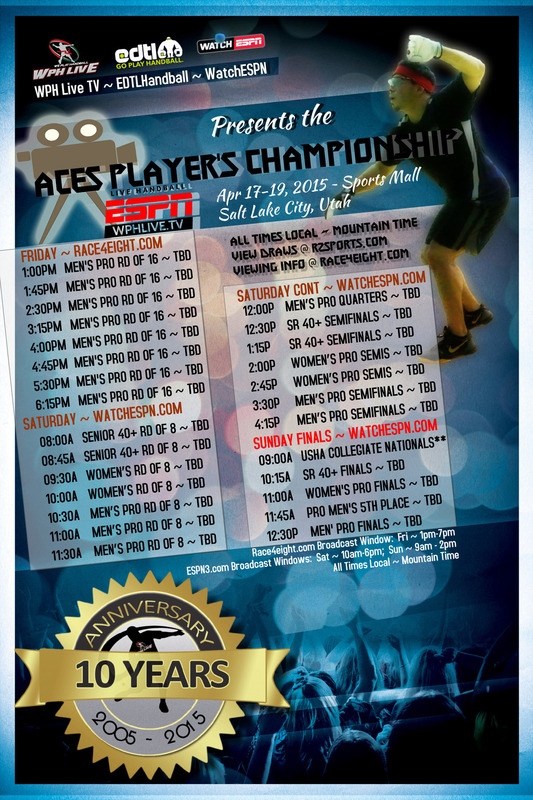 All of the WPH Aces Player’s Championship action will take place at the Sports Mall in Salt Lake City, UT from April 17th-19th (5445 S 900 E, 84117). If you cannot make it to beautiful Salt Lake City, All Access Pass Holders can watch bonus coverage on Friday, April 17th on race4eight.com. All of Saturday and Sunday’s WPH Aces Player’s Championship will be broadcasted lived on ESPN (http://espn.go.com/watchespn/). For information on how to enter the event or to follow the event, go to http://www.r2sports.com/tourney/home.asp?TID=13707. 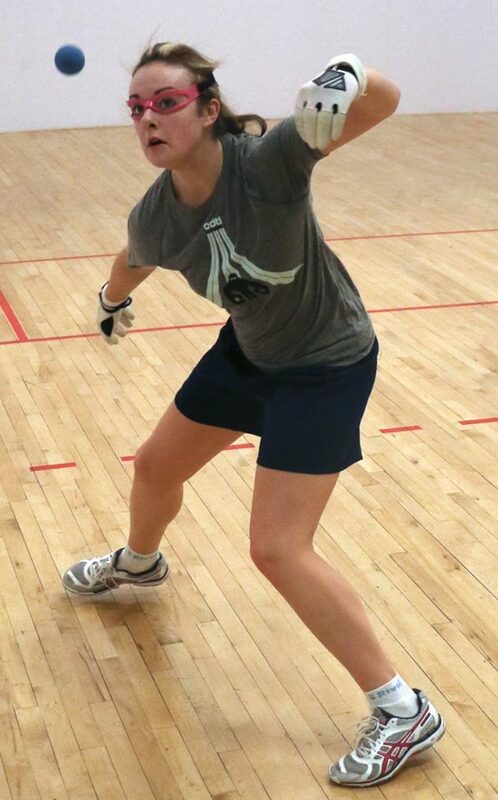 Like the World Players of Handball on Facebook, log onto wphlive.tv or follow the WPH on Twitter @dfwph and @wphlive for all of the updates from the 2015 WPH Aces Player’s Championship! The World Players of Handball is a non-profit foundation aiming to grow the game of handball through innovation and inspiring the next generation of players through junior clinics with certified WPH coaches, junior tournaments and the Race 4 Eight tour. Please consider making a tax-deductible donation today and supporting the growth of the game. 100% of the donations received by the WPH go towards junior handball development. Donate on-line at www.thehandballstore.com, send your generous gifts through PayPal (extremehandball@cs.com) or by mailing checks to: WPH, 3561 E. Sunrise Dr. Suite 125, Tucson, AZ, 85718. In 1980 our owner was a Civil Engineer with a newborn, and a desire to be his own boss. He saw an ad in the local classifieds for 1 garbage truck and 150 customers, titled “Ace Disposal.” Against all advice from friends and concern from his wife he left his career and bought Ace in September of 1980. He went on to drive the truck for about 8 years. His wife also dispatched and ran the bills, all while raising 2 young kids. After that he was lucky to find the one thing that makes any small business grow and succeed; good people. 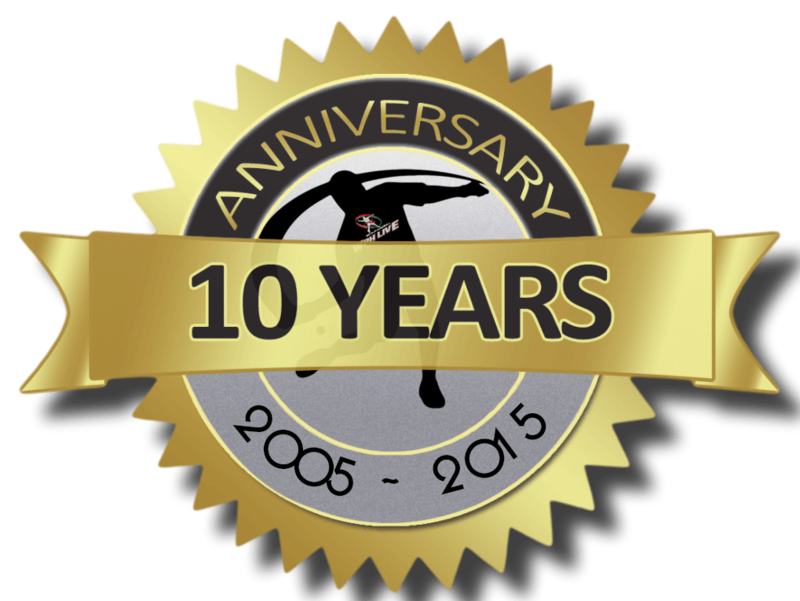 Over the next 10 years the business grew due to the hard work of multiple employees that still work at Ace today. Through numerous small acquisitions in the 90’s, Ace had become one of the largest independent haulers in Utah. To provide the highest level of quality service at reasonable and fair rates. 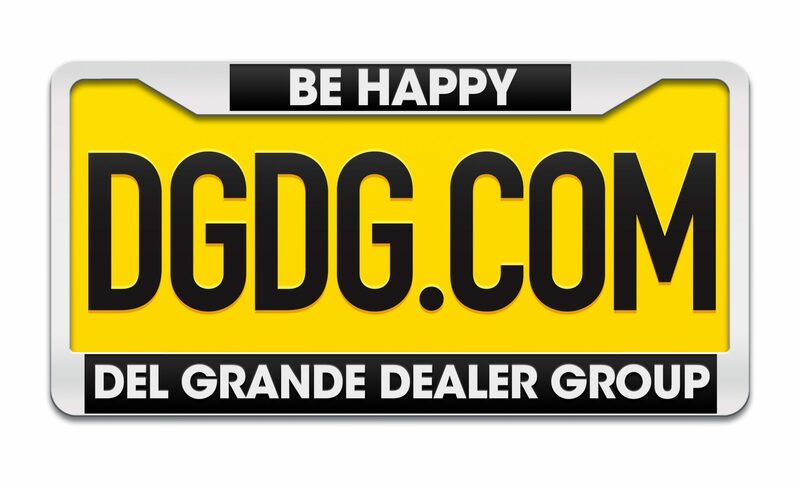 To provide our customers with friendly, efficient, affordable and safe service. To cooperate with the communities in which we operate in order to improve the quality of life using our resources. To provide a safe and secure working environment for our employees.